Sheets made of natural rubber or silicone are used in "membrane presses" to perform the operation of "Finishing" or "veneer" of wood. “Finishing” is the process which allows the panels, doors and other wooden shaped objects’ covering through a thin sheet of wood. “Veneer” allows the application of a thin layer of plastic material (usually PVC or PP) on the shaped objects to be coated. 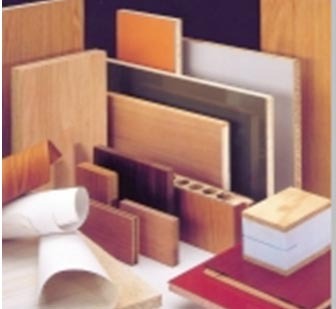 These operations are carried out thanks to the membrane presses that have the aim of keeping pressed the pieces to be veneered or ennobled until complete glue’s dry-out. The membrane presses have the task to press and heat the complete surface of the object to be laminated. There are several types of this industrial machinery depending on the manufacturer and the processing that this must perform. This type of presses work through a liquid to develop the required pressure and carry out the “veneering” work-out. The press consists of a tub filled up with liquid (water or oil) in which the membrane acts as a lid to prevent the overflow of it. This is kept at the desired temperature by the operator, through coils in which hot oil flows through. Some models have a double tank ensuring that the “veneer” on both sides of the panel. 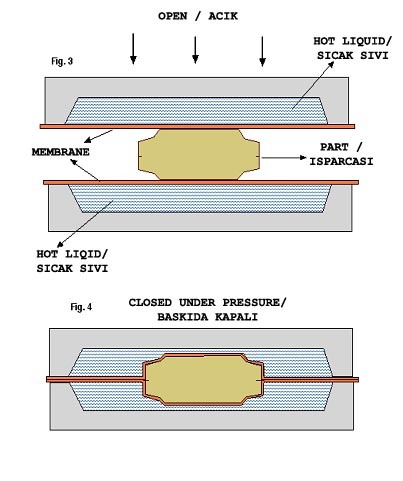 Specific developed pressures vary in accordance to the liquid type and the work-flow and stand between 8 and 20 Kgf/cm2 with temperatures’ range from 50 to 110 ° C.
Despite of others, this type uses “sucked” air from inside, to be compressed upon the membrane. Some presses for "soft" application, use depression only to apply pressure upon the object. 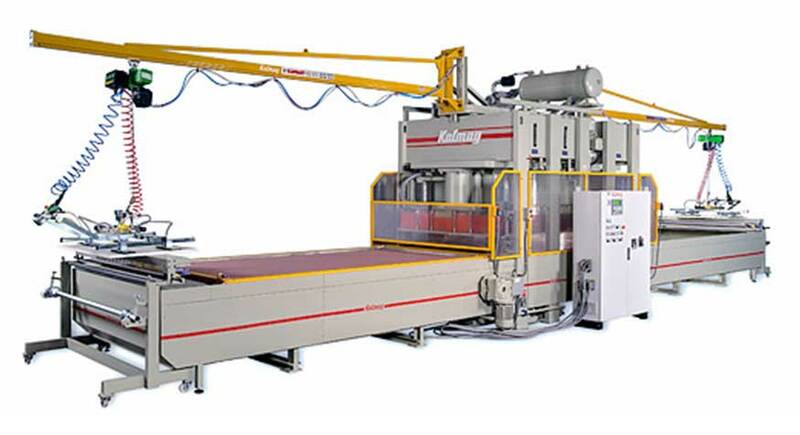 The heating sources may be different in types: heating plates upon which the membrane must be applied before the workpiece’s manufacturing, or electrical resistances which heat up. 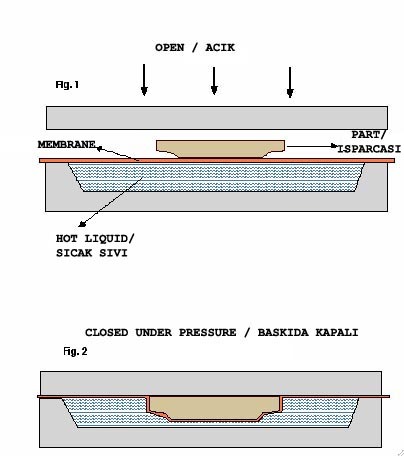 Specific pressures achieved by this type of machines may vary from 2 to 10 Kgf/cm2 and temperature rises up to 150 ° C.
Higher mechanical properties: Tear and perforation resistance, are surely two predominant features for this application, in fact un-smooth corners or unshaped edges can lead to a break-up of the membrane itself. High elongation at break allows perfectly to follow the shape of the molded parts and in the meanwhile to fill depressions up. Elastic Recovery: Other fundamental characteristic these type of plates must posses, to allow the reproducibility and avoid any lack of pressures, in case of pieces’ deformation, no required pressure will be granted. Temperature resistance: Obviously the more thermal resistand they are, the longer they last. Smooth & flawless surface: Very important feature, both in the thickness defects’ absence on the surface, otherwise they will be reported on veneered piece. Lifeshelf of the membranes ends in case of perforation , caused by operator’s error or by the thermal decay of its features. Extension of their life, is possible through a powder’s spreading on the surface to make it more slippery and consequently to avoid high elongation on small areas of the membrane. Sometimes the break-up is due to an incorrect support’s lay-out. Another inconvenient is linked to the the membrane’s swelling during oil’s contact, this is caused by the use of unsuitable or exhausted oils. Please contact us for your requirements of high quality silicone membrane for using at membrane presses for venering and lamination work.